Hello Planet! 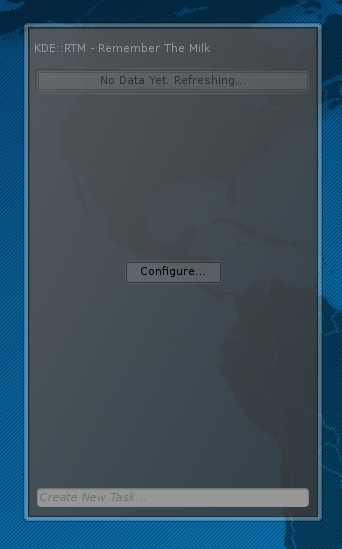 If all goes well, this post should be showing up on PlanetKDE. I’m most interested in user interaction and interfaces, and I initially got hooked on KDE due to the beauty of the Qt4 library and its excellent documentation. I use a Lenovo X61 Tablet and am very pleased with it. I think that tablet pcs allow for some very interesting usage and interaction models and I’d like to see better out of the box Linux support (and application support) for tablet PCs. 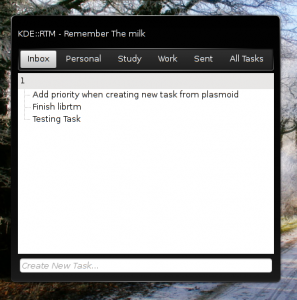 You can even create new tasks! Shown on the right here is the current design of the Remember the Milk plasmoid that I’m working on. 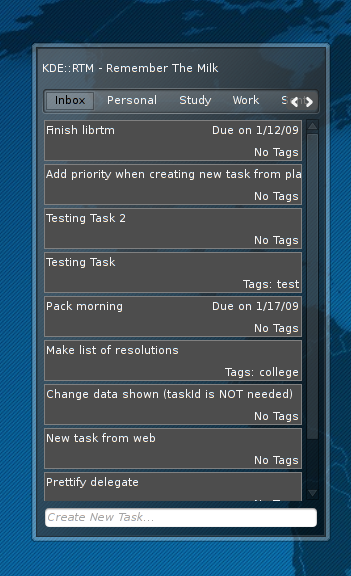 As of today it’s able to parse the tasks list and show only the tasks in the selected list. 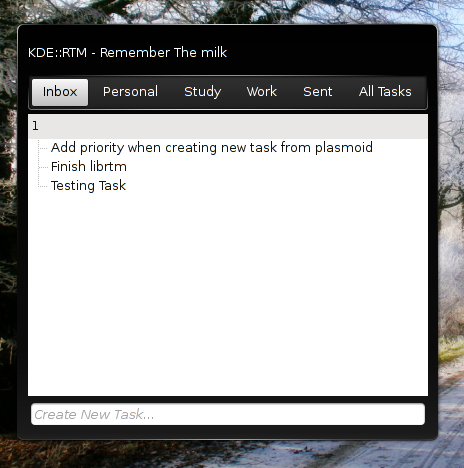 Additionally, it can add (for now only to Inbox) tasks to RTM using the line edit at the bottom of the plasmoid. Next up, beautifying the tasks view. I have plans play around with a QStyledItemDelegate which should allow me to have a list of tasks similar to the Amarok2 style playlist. They will be listed by priority, and can be rearranged (including changing priority) by dragging and dropping. I also need to spend some time rethinking how I wrote librtm. Right now everything is done synchronously, and although I continue to update the gui during web calls, not much else can happen. This also leads to extremely long startup times, which is not something that I want. I’ll write more in the morning, but I thought it would be nice to post a screenshot now. What you see in this is the beginnings of a Remember the Milk plasmoid. It uses the new librtm C++ library, which is being developed in tandem. Neither the plasmoid nor the library can write back to RTM at the moment but I’m planning on implementing that in the future. For the moment, read only, but the api will support writes in the future. I’m typing this blog post in dvorak as I’ve decided to switch. I’ll post more later when I can actually type faster than ten words per minute. WordPress (the software used to power this blog) 2.7 is nearing release. As I’m feeling a bit adventurous today, I’m going to install the release candidate on blog.chatonka.com. If all goes well, you should still see this post later on today. 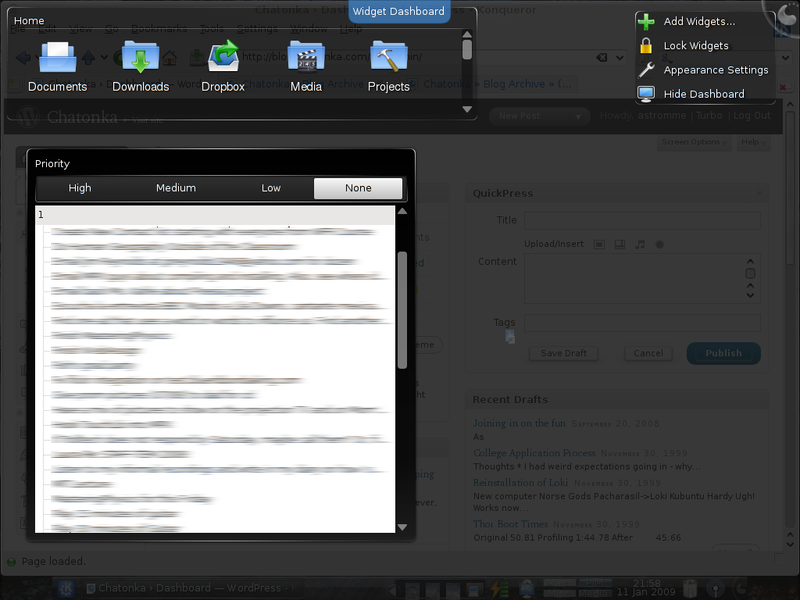 Later I’ll blog about how I use revision control to manage my wordpress install. It really makes updating vastly easier.